The all-new LiteRider scooter from Golden features better range, a Delta Tiller standard, more attractive styling and more vibrant colors. An updated tubular frame design supports a 300 lb. weight capacity, with completely wireless disassembly for easy transport. The all-new LiteRider scooter from Golden features better range, a Delta Tiller standard, more attractive styling and more vibrant colors. An updated tubular frame design supports a 300 lb. weight capacity, with completely wireless disassembly for easy transport. 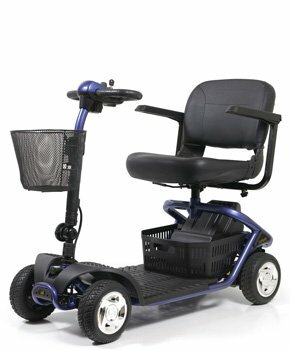 The LiteRider features 9" modern black, low-profile tires on high-strength steel rims with shiny hubcaps. Its plush, 17" wide by 16" deep black vinyl stadium style seat comes with adjustable armrests and a full 360 degree swivel mechanism for easy transfers on and off the scooter. A unique feature consumers will appreciate are the two standard storage baskets - one on the tiller and one under the seat, which also features dual bottle holders. The LiteRider scooter is available in gorgeous, deep shades of Red and Blue.